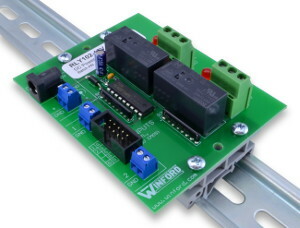 This relay board provides a convenient way to add relay outputs to your project, allowing you to switch high-current loads such as AC appliances, motors, and more. This board includes two SPDT relays, logic-level relay driver circuits, and protection diodes. Simply provide the board with power, connect your logic-level signals to the inputs, and the relay contacts are ready to use. The relay contacts are electrically isolated from the rest of the board, which allows the board to be used in a wide variety of applications, including both AC and DC loads. 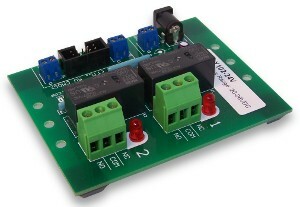 With this relay board, any logic-level signal (5V) or higher-voltage signal (up to 30V) can be used to control a relay. Examples of logic-level signals include the outputs of a PC's parallel port or a microcontroller's output pins. The board is available with three different relay coil voltages (5, 12, 24 VDC), allowing you to choose whichever is most conveniently available for your project. Suitable wall power supplies for the 5V and 12V models are available below. Please note that the relay coil voltage you select has no effect whatsoever on the voltages you can switch with the relay contacts. Also note that the relay coil voltage you select does NOT affect what voltage is needed for the input control signals. For any of the coil voltage options (5, 12, or 24V), an input control signal from 2.7VDC up through 30VDC will activate the relay. See datasheet for input current requirements. Power supply may be connected via DC power jack or via screw terminals. Approximate dimensions: 3.0" x 3.7"
NOTE: These relay boards are no longer being produced by Winford. We will continue to sell these products until existing stock runs out. To see the new design with updated hardware, check out the Relay 202 series. 12V Power (Out of Stock): See the new design for immediate purchase.